I thought of sporting different nails for all 7 days this week. I know this is little difficult to change nail wear everyday but if nail arts are simple & classy, you’d want to change it everyday. I had a lot fun while creating and flaunting my nails all this week check them out. They are simple and gorgeous. Purity of white and a dash of silver, turns out be be great combination. The ruffian blue matte nails. I named it BLUE SEA. Its bright beautiful and matte. A perfect wear on the beach. This are my twin colored leopard nails. White, sky blue and shimmer was my idea to create these nails. Inspired from the clay. I name it BLACK CLAY nails. It is earthy grey and with a matte- effect to make them like clay. 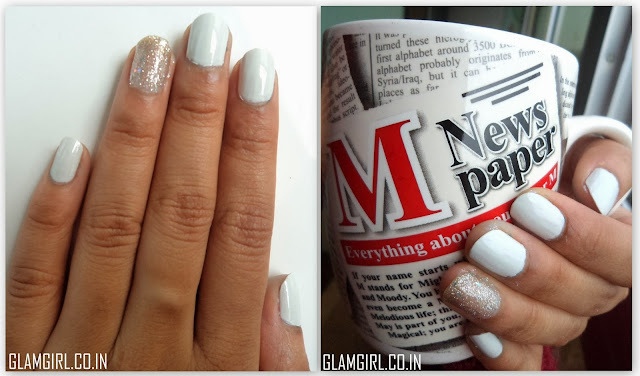 A dash of sparkles on neutral nails. I call them STAR SHINE. Cute stamps on a clear white canvas. You can say, for this post, I have worked for a week :p I hope you liked them. Which nail art would you wear? Tell me in the comment section.